The 7" in-wall android touchscreen is perfect for displaying the HTML5 application which runs on an IoT-modem. No more bulky and unhandy tablet mounts but a beautifully finished OEM in-wall solution. The touchscreen contains an IPS LCD display for perfect viewing angles and deep colors, with a resolution of 1024x600 and a brightness of 350cd/m² the screen is bright enough to be read in daylight. You can instal any application on the android operating system and connect with HDMI, analog video-in, USB-host, Ethernet and WiFi b/g/n. By default the screen comes with an in-wall mount bracking. It's however possible to order on-wall and tabletop mounts. 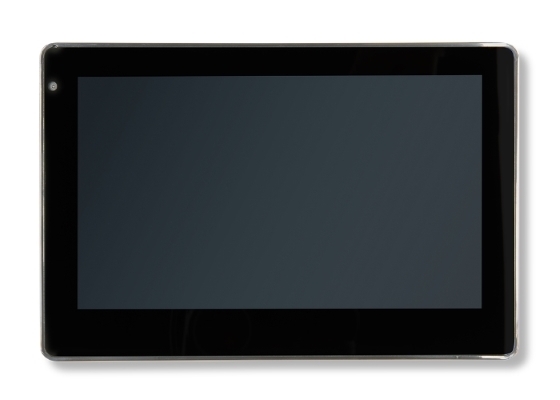 The Allwinner A20 processor gives the tablet plenty of power to display complex graphical interfaces. Smooth and fast user interaction becomes possible. Combine this with a capacitive touchscreen and the end customer will experience a quick system. Every touchscreen has a 12V jack power connection so you can power the screen from a wall socket. It's however also possible to power the screen through it's wired ethernet connection. The touchscreen has full support for IEEE802.3af which makes it compatible with any standard PoE switch or router. Do you want your interface to be really full-screen (without bottom button bar) or are you in need of a custom GUI application? The DPTechnics engineers can design your custome application, just give them a call or send an email. Questions about this product? Contact us now.